Summer chickens, make me feel fine. Something’s blowing through the jasmine in my mind and it’s got a hint of chicken poop in it, but that’s o.k. The humidity has been down lately, and so the smells don’t linger like they used to. Plus, we all know chicken poop is good for everything, so let it rip, ladies. However, summer seems to be winding down, or at least what most people think of summer is. Maybe technically we still have a bunch of September, but you know that if you don’t make August count, it’s all over. I’ve tried to explain this to the chickens, but they have odd interpretations of this advice. 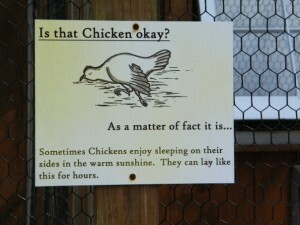 Before I had my own chickens, I visited some at the Franklin Park Zoo. Apparently, the chickens there like to stretch out in the sun so much that they put up a sign to tell you that yes, the chickens were o.k. I had kind of forgotten about that sign until this past weekend. I was trying to make the most of a waning summer weekend by doing stuff in the yard because I like to maximize my pain and suffering. Amazingly, my mother in law claims to like mowing the lawn. I have never heard of such a thing, but at least I don’t have to mow anymore. But that unfortunately frees up more time for tasks involving manual clippers. 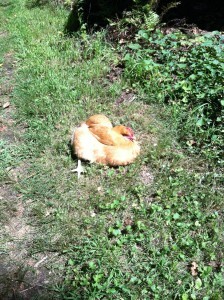 So I was out clipping stuff, and came upon one of the Mandrell Sisters lying on her side in the sun. Of course, my first instinct was to assume that we were at Woodstock and she had eaten the brown acid even though they said not to, until I remembered that it was not the 60s anymore. I wasn’t convinced something else wasn’t totally wrong, and then that lesson I learned at the zoo years ago came back to me. “Yes,” I said, “that chicken is o.k. They like to do that.” The chicken gave me look like I was an idiot for talking to myself, and went back to sunbathing. At least one of us was having a good time. I haven’t had much problems with broodiness and the Mandrell Sisters lately, at least not until our little talk about packing excitement into the end of summer. One of them went broody last Thursday, and so I put her into the isolation of the Miracle Broody Hen Cure, aka, my mom’s old bird cage. Usually this can blast the broodiness out of them in a day or two. Well, a day came and went, and there she was, still brooding. Two days went by. She had turned around in the cage, but was still puffed out and making the “I am broody” noise. Three days went by, and I was impressed with her commitment to this bit. After four days, I started to wonder how long she could be away from the others before I had to do an elaborate routine to introduce her back into the flock. On the 5th day I approached the cage, and upon putting my hand close to it and getting the broody noise in return, I had had enough. I figured I would put her back into the coop temporarily for a change of scenery, and if she was still broody that night, I’d bring her back inside. That way she’d also get reacquainted with the others, so I could hopefully avoid any reintroduction rituals. I picked her up out of the cage while she did her best pufferfish impersonation, and there, underneath her, was an egg. She was most definitely broody when I put her in, and I didn’t think broody birds laid eggs until the real or imaginary ones they were sitting on hatched. This would probably explain why she wasn’t snapping out of it, but how that egg got there is a mystery. I took her outside and put her into the run while I filled up the feeder. She puffed around a little, then hopped up on one of the roosts, and began a run of top volume clucking for about 5 minutes. This was at 5 in the morning, mind you. My cries of “shhh, chicken!” did nothing to silence her. So I grabbed her and put her inside the coop with the others while I finished up. They all eventually came back out, and she went right back up on the roost, but rather than continuing her earlier monologue, she produced the gigantic, nasty poop that is the general indicator that broodiness has left the building. My plan that I didn’t really even think was a plan had worked. I allowed myself to feel good about it, while stepping away from the massive stool. That chicken is o.k. Both physically and existentially. Clearly my standards for what constitutes making the most of the rest of summer have changed. But I suppose chickens will change a person. I’d like to be able to just hang out in the yard with the chickens without doing any sort of manual labor, but our yard seems unwilling to compromise. I suppose if I do have to be out there doing work, at least I have chickens around to keep it entertaining. This entry was posted on Friday, August 16th, 2013 at 4:02 pm	and is filed under Backyard chickens, Broody hens, chicken noise, Chickens, Miracle Broody Hen Cure, Smells. You can follow any responses to this entry through the RSS 2.0 feed. You can leave a response, or trackback from your own site.